Forest growth is well known to reduce the environmental impact of fossil fuel usage because it fixes carbon and so takes CO2 out of the atmosphere. The recent forest fires in BC and elsewhere have burned a lot of that carbon and returned the CO2 to the atmosphere. What is the relative size of the CO2 emission of the forest fires compared with that from fossil fuel usage? Dr. Werner Kurz has the answer. He is a Senior Research Scientist with Natural Resources Canada, and also leads the team that develops Canada's forest greenhouse gas inventories and the Forest Carbon Management Project of the Pacific Institute for Climate Solutions (PICS). Dr. Kurz says that in 2017 about 1.2 million hectares of forest burned in British Columbia, and 1.3 million hectares and counting this year. Compared to the average annual area burned in the province between 1990 and 2015, each of the last two years burned 15 times more than the average area. 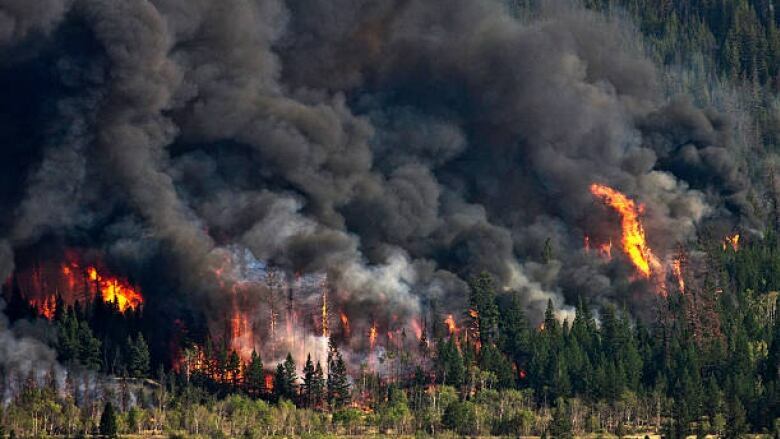 Forest fires like these release carbon dioxide and other greenhouse gasses, such as methane into the atmosphere. The initial - albeit unofficial - estimate is that the direct fire emissions in 2017 were about 150 (plus/minus 30) million tons of carbon dioxide.This is two to three times the emissions from fossil fuel burning from all other sectors in B.C. But the impacts on the atmosphere are even greater because the many trees killed by fires will decompose over the next decades, releasing more carbon dioxide into the atmosphere. Also, trees killed by fires will not be removing carbon dioxide from the atmosphere as living trees would. Therefore, the combined impact on the greenhouse gas emission balance is larger than just the direct emissions. Fortunately, most forests affected by wildfires will regrow in future decades, and remove carbon dioxide from the atmosphere again.